So your friend is running a serial novel, and you never read anything in their genre, but you still want to show some support? Or you are reading some really awesome serials and wish you could do more than just vote and comment? Do you want to promote a serial, but don’t want to be on social media? Or would you like to get some exposure for your own blog while helping a writer? Here’s a list of things you can do to support a serial and its author. Please note: This was written primarily with the books on JukePop Serials in mind, but most of the points are valid for serials on personal blogs, Wattpad and other platforms as well. I have colour coded the points for simplification: Quick & simple – medium – complicated or time-consuming. 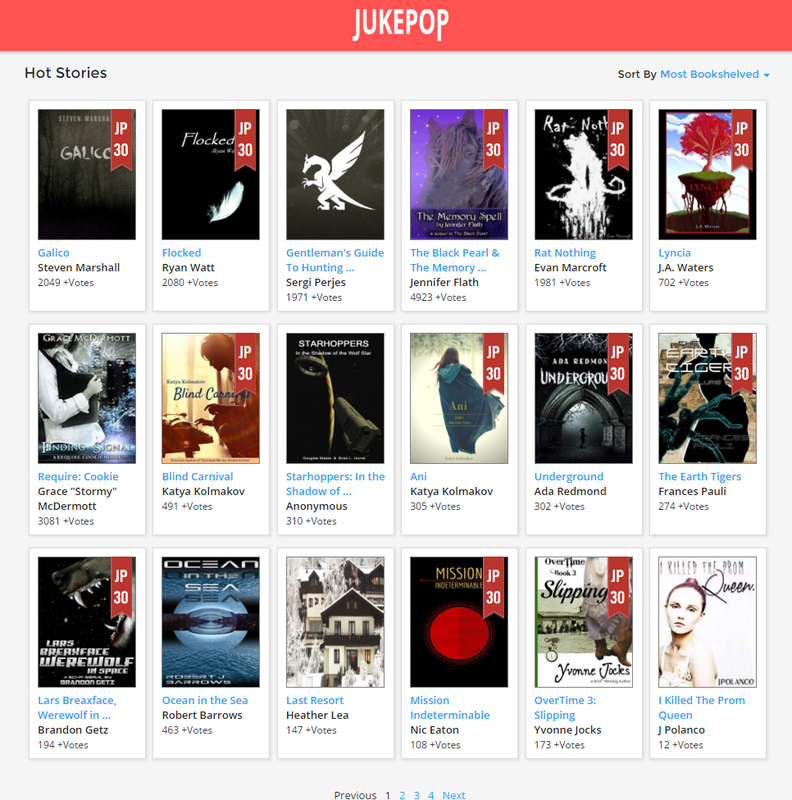 A screenshot of some of the stories getting attention on JukePop on a given day this month. By bookshelving a serial, you help it climb the charts when others sort through stories. It shows readers on the site that the serial has made others interested and makes it easier to discover it for new readers. Readers are important to books of any kind, and usually analytics will tell the author that someone has visited their serial. Don’t feel daunted by a serial that already has several chapters out. Authors don’t expect you to read half a novel in one go. They are just happy if you decide to check out their story (and get even happier if you get hooked and keep reading over time). Voting is one of the most important things of a serial on JukePop. You can vote once for every chapter of every serial. Some readers follow several serials and vote for their favourite chapters as they go along, others only read one and vote for every chapter. Sometimes one or two votes can make a great difference as to a serial’s placement on the charts and can determine whether it ends on the monthly Top 30, so even if you only manage to read one chapter, every vote does count. Feedback is great and every writer loves it. A lot of them enjoy hearing observations and speculations and getting suggestions and thoughtful critique. But don’t feel intimidated or afraid that you have to say something groundbreaking. Most writers love hearing a simple, “I liked it!” just as much. (Plus it will bump the serial to the top of the front page if we’re talking JukePop and this gives it a bit more exposure). Leaving a review is as easy as leaving a comment, but you may want to write something a little longer or helpful to other readers who are considering reading the story. You can leave a number of stars with your review that will help reflect the serial’s overall reception. When you finish a serial (or what is published of it so far) on JukePop and click “next”, you are taken to a page where you can let the author know that you want more. If you click that link, you earn the serial a bit more exposure and make the writer happy. Some serials have a donation button. If you have some change to spare, you can help the writer. Regardless of the amount, the writer is likely to really appreciate the thought. – Some writers have a Patreon page, and supporting them there can make a big difference to how much time they can afford to spend working on their serials. Most serials have “share” buttons. By using those, you can tell your own followers on Twitter or friends on Facebook that you like the serial, and then they may get curious and check it out too. If you are using Pinterest, Tumblr, StumpleUpon, Google+ or other platforms, it’s usually easy to link to the serial from there as well. Even today when a lot of marketing is done online and the serial is a web-based medium, word of mouth is really important. Don’t twist the arms of everyone you ever met to read and vote for every single chapter of your favourite serial, but you can always mention this cool serial that you’re reading/that your friend is writing/that you have heard of. If you are in a reading group or have friends or family who enjoy reading, they may be interested. If the serial is listed in a database like Muse’s Success, Web Fiction Guide or Write Now Wiki, you can often review it there, comment its entry or add it to a list of stories you enjoy or recommend for other users. While it’s not directly related to helping one serial, it can still help spread the word if you interact with its writer on social media (follow them on Facebook or Twitter or subscribe to their blog). If the serial is published on a platform with an official Facebook page, why not like that too? If you are up for it, there’s a lot of other things you can do. Some of the suggested things are quick and easy while others are probably only for the very, very dedicated. Do you run your own blog? Offer the writer to let them make a guest blog or interview them (or write a review of their serial). Most writers love getting fanart (drawings of the characters in the story) and fanfiction (fan-written stories about the characters in the story). Maybe you can ask the writer if they have flyers that you can hand out in your local library, café or tennis club or just send the writer a mail and tell them you really liked their serial. Or, and this is where we get really crative, why not make a Wikipedia or TV Tropes page about the book? Make a fanpage (on Tumblr, Facebook or somewhere else). Post a picture on Instagram of your cat on the keyboard while a window with the serial is open on your computer, or make a Youtube review. If you’re on Polyvore, why not make an outfit inspired by the serial? Or how about making a fanmix of music that reminds you of the serial on 8tracks? You could even cosplay your favourite character and send a picture to the author. The sky’s the limit. Anything to add? Don’t hesitate to leave a comment below.